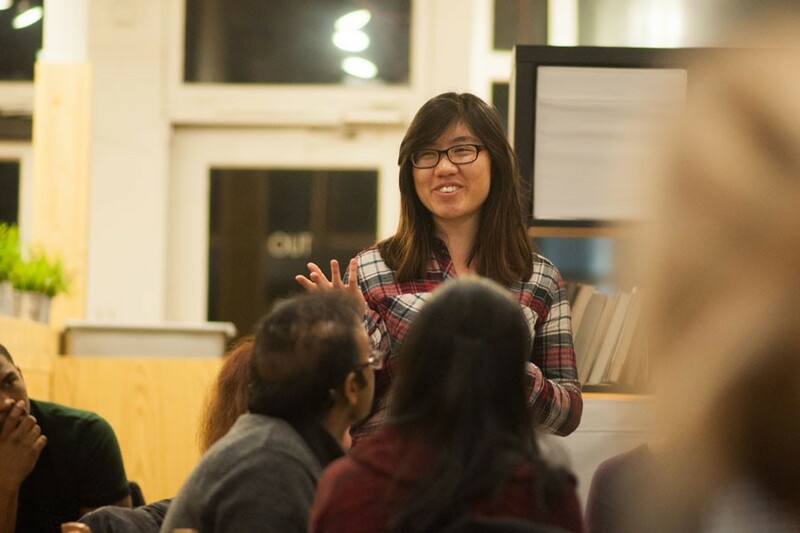 SESP junior Jing Lee, vice president of NU Campus Kitchens, addresses a crowd of 30 Evanston residents and NU students at a community discussion about food waste in the city Thursday. The meeting marked the beginning of a new campaign called Plates Over Waste which hopes to redistribute unused food to people in need. Evanston residents involved in a campaign aimed at reducing food waste in the city held a meeting Thursday to initiate community dialogue about local food insecurity. The campaign, Plates Over Waste, brought together residents and Northwestern students for a public discussion at Coffee Lab, 910 Noyes St.
Plates Over Waste is an initiative within the Millennial Action Committee, a political action group that works with Evanston youth to address community issues, said Bobby Burns, the committee’s co-chair and co-founder of the campaign. Devon Malcolm Reid, Millennial Action Committee co-chair and Plates Over Waste co-founder, said he and Burns were inspired by French legislation passed in May. The unanimous decision by the French National Assembly obliged supermarkets to donate unsold food to charity or to repurpose the food as animal feed. Plates Over Waste is seeking similar changes in Evanston, where Reid said one in seven residents suffer from food insecurity and 270 tons of food are wasted every week. The event was an open dialogue among organizations fighting to limit food waste. Representatives from Evanston Food Exchange, Edible Evanston and Zero Percent attended and shared their opinions on moving forward with the campaign. As a sector of the Millennial Action Committee, Plates Over Waste prioritizes reaching young members of the community, Burns said. Evanston Township High School students spoke at the meeting about ways in which their school can partner with Plates Over Waste. Representatives from NU Campus Kitchens and Points for a Purpose, two University initiatives concerned with food waste on campus, also participated in the discussion. The ordinance Plates Over Waste hopes to pass would reduce the amount of food wasted and redistribute the unused, edible food to those who need it, Lee said. “Their push to get more restaurants donating wasted food or recovered food would be really helpful for us as a way to engage more in the community,” NU Campus Kitchens program coordinator Samantha Warren told The Daily. Warren also said many restaurants do not understand the process of donating unused food and mistakenly assume there are legal ramifications for doing so, but through education, Plates Over Waste can teach the community how to safely donate food to Evanston residents who need it. More so, Reid said the 1996 Bill Emerson Good Samaritan Food Donation Act protects food businesses that donate food from liability if the beneficiaries get sick from it. Organizers said the discussion at Coffee Lab was Plates Over Waste’s first step in a larger process of advocating for political change. Reid said he hopes for an ordinance that will require Evanston grocers to donate unsold food and for Evanston restaurants to compost. In addition to such policy changes, Plates Over Waste aims to educate the public about donating and composting unused food, Burns said at the event.